Seoul, Dec 23 (Just News) : The U.N. Security Council unanimously imposed new sanctions on North Korea on Friday for its recent intercontinental ballistic missile test, seeking to limit its access to refined petroleum products and crude oil and its earnings from workers abroad. In November, North Korea demanded a halt to what it called ‘brutal sanctions’, saying a round imposed after its sixth and most powerful nuclear test on Sept. 3 constituted genocide. 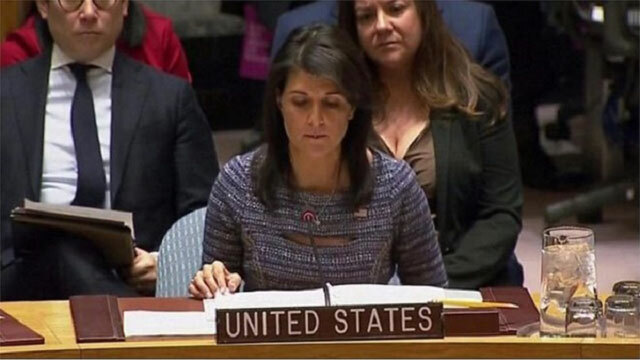 ‘It sends the unambiguous message to Pyongyang that further defiance will invite further punishments and isolation,’ Nikki Haley, the U.S. ambassador to the United Nations, said after the 15-0 vote. Wu Haitao, China’s deputy U.N. ambassador, said tensions on the Korean peninsula risk ‘spiraling out of control’ and he repeated Beijing’s call for talks. It also reiterated a call for what it calls a ‘dual suspension’ proposal for the United States and South Korea to stop major military exercises in exchange for North Korea halting its weapons programs. South Korea welcomed the sanctions and called on the North to ‘immediately cease reckless provocations, and take the path of dialogue for denuclearization’. On Friday, North Korea called U.S. President Donald Trump’s recently released national security strategy the latest attempt to ‘stifle our country and turn the entire Korean peninsula’ into an outpost of American hegemony. ‘The cap on oil would be devastating for North Korea’s haulage industry, for North Koreans who use generators at home or for productive activities, and for (state-owned enterprises) that do the same,’ said Peter Ward, a columnist for NK News, a website that tracks North Korea. ‘If the game plan is to use sanctions as the last non-military policy tool to induce North Korea’s return to the denuclearization table, we may quickly find Washington prioritizing military options,’ Park said.